In an era of massive enclosed stadiums like Ford Field and Washington’s FedEx Field, it almost seems quaint. But standing below the vaulted ceiling of the Design Dome at the General Motors Technical Center in Warren is still an awe-inspiring experience. Listen carefully and you might hear the voice of GM’s first styling director, Harley Earl, looking over a concept vehicle for the 1959 finned Cadillac Fleetwood, one of the last models produced on his long and celebrated watch. Or maybe you’ll catch an echo of his successor, Bill Mitchell, showing the GM board the radical, turbine-powered Firebird IV before its debut at the 1964 New York World’s Fair. The Dome, notes GM styling chief Ed Welburn, has been used for every new model since 1956. Along with the connected styling studios, the Dome is “a holy place,” says Welburn — and it’s also one of the most storied buildings on the 710-acre Tech Center, designed by renowned architect Eero Saarinen. Construction began in 1949, and the campus took six years to complete at the then-astonishing cost of $100 million. It has been hailed by the American Institute of Architects as one of the most outstanding projects of its time, and has been designated a National Historic Landmark. It also has been labeled an “Industrial Versailles” by architects. But for those working at the design facility — or any of the 37 adjacent buildings — the site was beginning to look and feel increasingly timeworn by the summer of 2014. When a massive rain storm hit last August, dumping a near-biblical torrent in Warren that overwhelmed much of the Tech Center, models under development on the lower floors of the design center were left floating, or sunken beneath the murky sludge. Sometimes it takes a crisis to move things forward — that and a major shake-up in GM’s senior management. Even before the last of the floodwaters were drained, a process that took weeks, GM was moving ahead on a major renovation of the Design Dome and the adjacent styling studios by upgrading worn equipment, improving lighting, and redoing the floor plan to enhance the aesthetics and feel of the space. The multimillion-dollar project would, on its own, have been significant — but GM didn’t stop with the Design Dome. In May, the automaker announced a series of massive new investment projects, with much of the money going to plants like the Lansing Grand River Assembly, which is building the 2016 Chevrolet Camaro. Another $1 billion will be dedicated to upgrading the company’s U.S. design and engineering operations. Some of the money will go to the automaker’s vast proving grounds in Milford Township, but most of the allocated funds will flow into the Tech Center. In a bid to be competitive, he says GM has to address an array of issues, including the addition of new tools used to conceive, design, and engineer the products that will help General Motors regain its past glory. The time to develop new vehicles and update current models also has to be reduced, while incorporating cutting-edge technology required by regulators and consumers alike. “This is a hallowed place for us, but we’re using technology from 60 years ago,” Reuss says. Even the most advanced machinery, like computer-aided design and engineering systems, only goes so far. And that’s where GM knows it faces a major struggle. When President Dwight D. Eisenhower dedicated the Tech Center on May 16, 1956, GM could count on drawing the country’s best scientists, engineers, and designers. Today, it faces a brain drain, with talent drawn not only to local and foreign competitors, but to newer, hotter, and hipper places to work like Google, Apple, and Tesla. “Long gone is the day when we could get our pick of the best talent,” says David Cole, director-emeritus of Ann Arbor’s Center for Automotive Research. While GM has announced the most extensive — and expensive — upgrade to its local design and engineering facilities, it’s by no means alone. 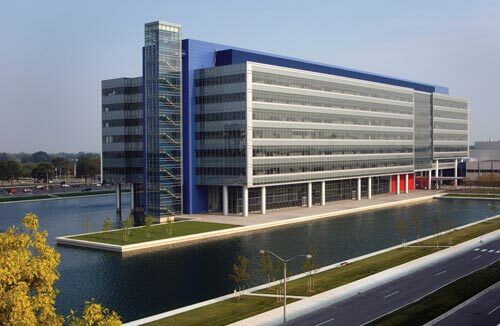 Its key cross-town rivals, Ford Motor Co. and Fiat Chrysler Automobiles, are also investing in major upgrades while working to attract the world’s best and brightest designers, engineers, and researchers to the Motor City. The drive has a particular urgency to it, coming in the wake of the huge cutbacks that were forced on the industry due to the 2008 global financial crisis. Nowhere was that more apparent than the massive Chrysler Technology Center in Auburn Hills. The automaker’s bankruptcy in 2009 left little more than a hollow shell. Today, however, CTC is busier than ever. While some worried that the takeover by Italy’s Fiat SpA would be a repeat of the ill-fated “merger of equals” with Germany’s Daimler, you’d have a hard time believing that during business hours at the complex. Workers jostle for space as they walk through the halls, and in some parts of the building it can be a challenge to find a desk for a new hire as the U.S. tech center takes on much of the work once handled by the European side of the company. It’s not unusual to find impromptu meetings taking place in hallways and cubbyholes scattered around the center. “Having it all under one roof gives our engineers the ability to do the entire job from behind their desk or by walking a short distance. They can see everything happen live, right here, in the same place,” says Bill Rotramel, FCA’s vice president of vehicle concepts and integration. On the other side of Detroit, Kevin Layden is facing a similar challenge. The head of Ford’s electrification program, he is in charge of what could become the most significant transformation of the way vehicles are powered since the internal combustion engine became a dominant force a century ago. Fittingly, his team is now headquartered in the historic Engine and Electrical Engineering Building, known as the “EEE” building near Henry Ford Museum in Dearborn, where Henry Ford himself once had an office. In fact, a giant mural of the company founder looks down over what Layden describes as the “City Center,” a new open space that, like much of the redesigned building, has been heavily influenced by the collaborative strategies of Silicon Valley. Apple and Google, among others, have discovered that some of their best projects have arisen almost accidentally, and spontaneously, as the result of chance meetings in corridors and cafeterias. 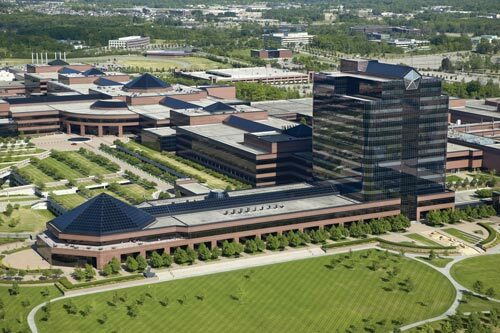 In turn, the automaker plans to invest up to $1 billion to redo its neighboring research and engineering campus over the next several years. The multi-building campus is located across Oakwood from The Henry Ford. One measure of the renovations will be how quickly Layden’s team grows. Designed by Albert Kahn and first opened in 1925 as the Powertrain Operations Engine Engineering (POEE) Building, the Dearborn facility has gone through plenty of changes over the years, and the latest renovation is easily the most extensive. It already houses 500 engineers and support staff dedicated to the development of hybrid, plug-in, and pure battery-electric vehicles. By year-end, Ford plans to hire another 200 workers. Interestingly enough, Ford isn’t the first automaker to pull back the veil on its high-tech patents. And while it plans to charge licensing fees, rival Tesla Motors last year said that it would make its own patents available at no charge, albeit with much the same goal as Ford in mind. “If we succeed, it will help kick-start electric vehicle sales,” Tesla CEO Elon Musk declared in June 2014. While Tesla barely even shows up on the industry sales charts right now, the aggressive California startup is one reason why Ford, along with GM and Fiat Chrysler, are moving so quickly to upgrade their R&D operations and re-think some of their most fundamental strategies. (Consider that Ford CEO Mark Fields likes to say his company is now in the “mobility” business, rather than something as archaic as simply building cars.) And if Tesla — which has a higher stock market valuation than Detroit’s Big Three and Toyota, Volkswagen, Nissan, and Honda combined — isn’t enough of a concern, what about Google and Apple? The search engine giant has emerged as one of the leaders in autonomous vehicle technology and is beginning the rollout of a fleet of so-called Google Cars it plans to test near its Silicon Valley headquarters. The head of the program, Chris Urmson, has said Google doesn’t plan to build its own vehicles but would prefer finding partners — an option that FCA CEO Sergio Marchionne reportedly has gone to California to discuss. Apple has been playing more coy, but there have been widespread rumors it is developing a minivan-like electric vehicle, likely with extensive autonomous capabilities and, of course, state-of-the-art smartphone integration. Uber also is said to be working on an autonomous vehicle. What’s more, design and production techniques are changing rapidly. The team at Chrysler’s Technical Center, for example, is handling a significant workload for products that are sold only in Europe. And although the next Buick might go up for its first design review at the Design Dome, it very well could have its styling led by a team at the Pan Asian Technical Automotive Center, or PATAC, in Shanghai’s booming Pudong industrial district. In recent years, such collaborative efforts would have generally been centered out of Detroit. Designers and engineers overseas might have crafted a model or even a working prototype and shipped it back to Dearborn, Warren, or Auburn Hills. Occasionally, a senior executive from Michigan would have gone to the hinterlands for a review — former Ford chief of design Jack Telnack recalls doing half-day layovers in Australia before returning to the home office. It was a grueling process. The PowerPoint era has helped cut some of that travel, making it easy to sit people down at tables to present and discuss their ideas while panning a video conference camera to show off the latest prototype. That’s far from the hands-on process needed today, though, as the auto industry evolves more rapidly and becomes more competitive. Coming up with a truly immersive approach is the sort of challenge that keeps Elizabeth Baron busy. 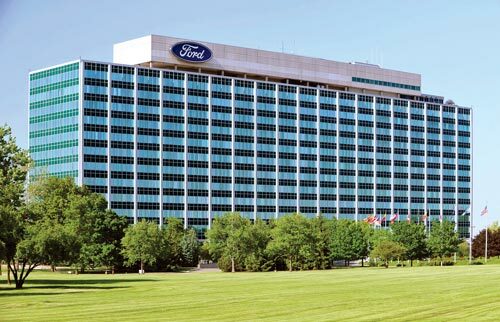 Overseeing Ford’s Virtual Reality and Advanced Visualization efforts, she needs to be sure that on any given day, a product development team in Dearborn can operate as if they were in the same room as their counterparts in Palo Alto, Australia, China, Mexico, or Brazil. All now host major virtual reality centers or satellite locations, with another center to open in Europe shortly. Of course, there are times when almost-real isn’t good enough. That’s why GM has invested so heavily in the redevelopment of the Tech Center’s Design Dome. Recently completed work includes an advanced lighting system operated by an iPad that can dial in colors from cool to warm. Video images can be projected on the round room’s domed ceiling or on drop-down video screens. “We basically rewired the whole building,” GM styling chief Welburn says. Meanwhile, an outdoor courtyard also was upgraded to allow future products to be viewed in a more natural setting. Will all these upgrades to hardware and processes take things the next step and draw in the sort of people needed to power the machines? That will be critical, according to Chrysler’s Rotramel. He says he’s feeling increasingly confident based on the talent the automaker has been attracting of late. “We’re finding ways to sell … what we have to offer,” he asserts. Rotramel and others say that no matter what a manufacturer might put forward, there are other factors that are critical to pulling in the best and brightest, including positive stories coming out of downtown Detroit, Midtown, Corktown, and along the Detroit River. One only has to head downtown on a weekend to see the increasingly lively dining and entertainment scene — or simply try to find an apartment to rent in the central business district. A new, younger generation of Americans has embraced the urban lifestyle, contends Sandy Baruah, CEO of the Detroit Regional Chamber. “The ethos of this generation is very different,” and the potential to be part of an historic urban comeback seems to be clicking with the younger generation. Whatever the reason, southeast Michigan — indeed, the state at large — has to make it work, Baruah believes, noting that there are an estimated 375 technical centers in Michigan. The big local players like GM, Ford, and Fiat Chrysler run some. Others may employ just a handful of technicians seeking close proximity to the EPA environmental testing facility in Ann Arbor. In many ways, they all face the same challenges. GM CEO Mary Barra recently said that she expects the auto industry to change more in the next decade than it has in the last half-century. Savvy players know they’re running an endless marathon, not a short foot race. That means continually upping one’s game through reinvestment and reinvention. The steps Detroit’s Big Three are undertaking suggest they’re not making the same mistakes of the past, and are determined to be the ones at the head of the pack.